the establishment in cooperation with local Universities and Institutions of a Marine and Maritime Research, Innovation, Technology Centre of Excellence. The Institute undertakes initiatives that will strengthen and enhance cooperation in the Eastern Mediterranean region, thus giving impetus to the creation of an EU Strategy for the Eastern Mediterranean, in line with the EU’s Integrated Maritime Policy and Blue Growth Strategy. 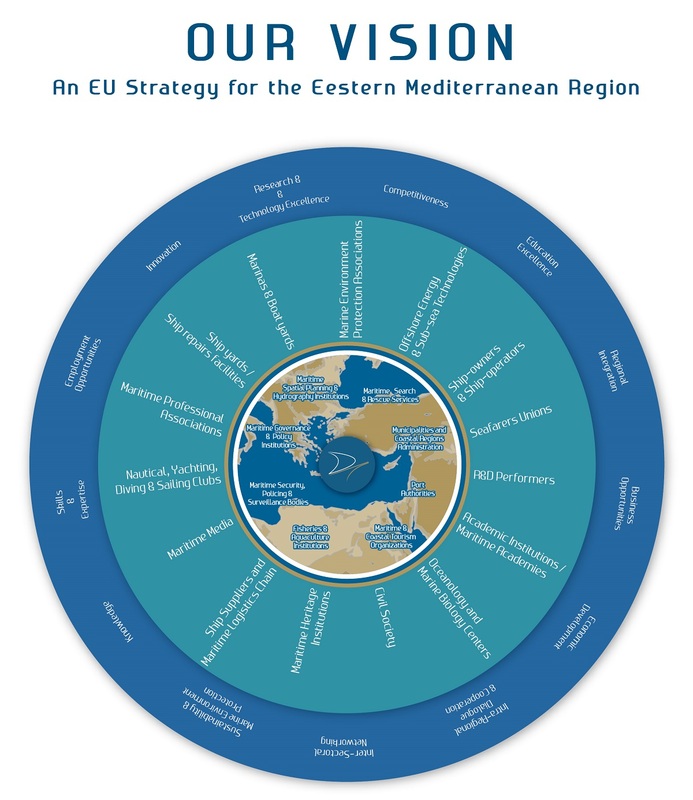 This strategy will provide an integrated framework for the identification and implementation of shared objectives and priorities along with viable actions and joint initiatives, thus addressing challenges and opportunities with a cross-border dimension in the Eastern Mediterranean. It will promote sustainable economic and social growth of the region by improving its competitiveness and connectivity -in both transport and energy fields- , while preserving the environment and ensuring healthy and balanced marine and coastal ecosystems. To this end, it will foster cross-border partnerships and synergies between local, national and regional actors across various sectors. The Strategy will also constitute a driver of innovation in the region through the promotion of research, cluster development, knowledge and technology transfer as well as industrial partnerships, leading to increased investments which will boost the economies of the Eastern Mediterranean. By setting in motion networks and/or reinforcing existing networks between education, training and research institutions and businesses, the strategy will also contribute to jobs creation, to human capacity building and to the mobility of students, researchers and workers in the region. Furthermore, considering the geo-strategic importance of the Eastern Mediterranean, this strategy will facilitate interoperability and data exchange to improve real-time response to emergency and crisis situations and to ensure the safety and security of activities at sea, while strengthening the stakeholders’ institutional and administrative capacity. In this way, the Strategy will provide an overall framework for policy coordination, territorial cooperation and harmonized use and implementation of resources, legislations, actions and structures, contributing to the overall economic development of the Eastern Mediterranean.